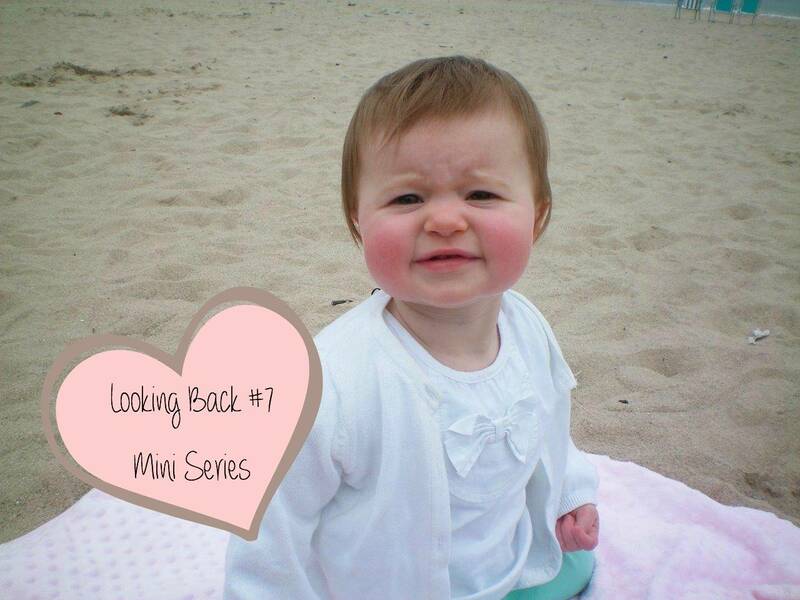 Welcome back to my little mini series where I am looking back over our family memories, if you have missed one you can pop here to catch up. For me it’s really important for us to have the time away from normal every day life, a time where the daily chores don’t get in the way of having fun and making memories. I just couldn’t wait to do this with my own little family. We decided to have our first holiday as a family of three in the UK and somewhere that was child friendly. We had a few recommendations about a place called Bluestone in Wales and when I looked at their website, I knew this was the place for our first holiday with Alice. I quickly booked it up for a week in June and then started making a list of all the things we would need to take with us. I think this was probably the longest list I have ever written and I love a list! I just couldn’t believe the amount of stuff we would have to take. Alice would be ten months old when we were going and she doesn’t travel light!! Anyone that knows me, knows I like a plan. I work best when I know what is happening and what I am doing when. This holiday was no exception, in fact I was probably worse than normal being a first time mummy and it being our first holiday. Food, oh my goodness the amount of food we had to take, it was basically just our normal weekly shop. And as for clothes and bits for me, well that was all a bit last minute and I didn’t have much room to pack much for me! I remember thinking oh this is what it is like to be a mum, I only take one pair of flip-flops and not three anymore. So, the plan was to pack the car up and head off in Alice’s morning nap time and take advantage of her sleeping for some of the first part. It was going to take us about three hours and we planned to stop and feed her on the way. I remember looking in the back of the car and it so full you could just about make out Alice in the back…thinking whatever would we do if we had another one, how would we fit it all in!! The journey went well and we arrived ready to begin our holiday. We couldn’t get into our lodge until 4.30pm, which was Alice’s dinner time and so while Andy went to get the car and bring it down to the lodge I sat outside the back door on the picnic bench feeding Alice. But, then we were in and the lodge was really lovely. I moved a couple of things around to make it more Alice friendly and with her toys all set out, she quickly felt at home. They had thought of everything when it came to children, black out curtains in the bedrooms, stair gates, travel cots, high chairs. It was really was home from home. Except, it didn’t have a bath and the shower cubicle door was awkward to be able to sit Alice in it and shower her. So, instead Alice had her first ever bath in the kitchen sink and she loved it! Alice loved it, phew! 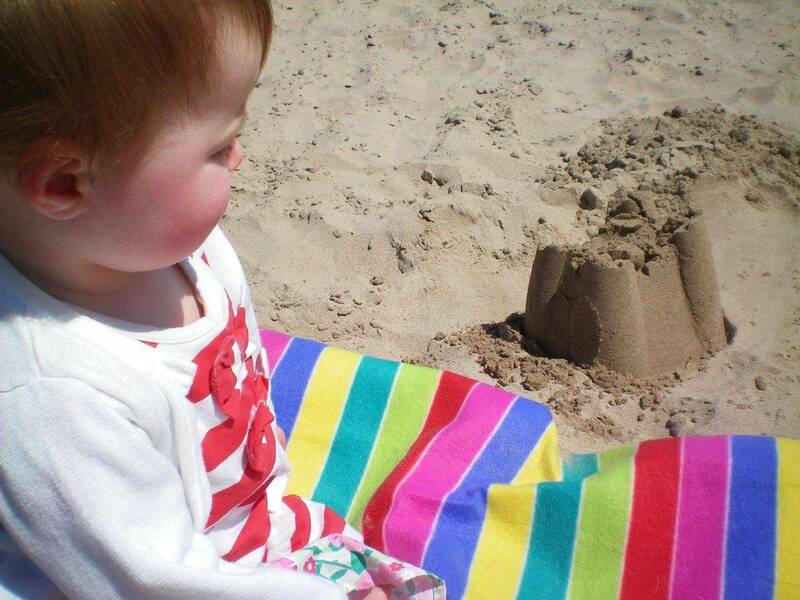 Yes, she wanted to eat the sand, but once we got over that stage we had fun building sandcastles. But, to be honest we didn’t stay long because really there isn’t much to do on a beach with a ten month old. 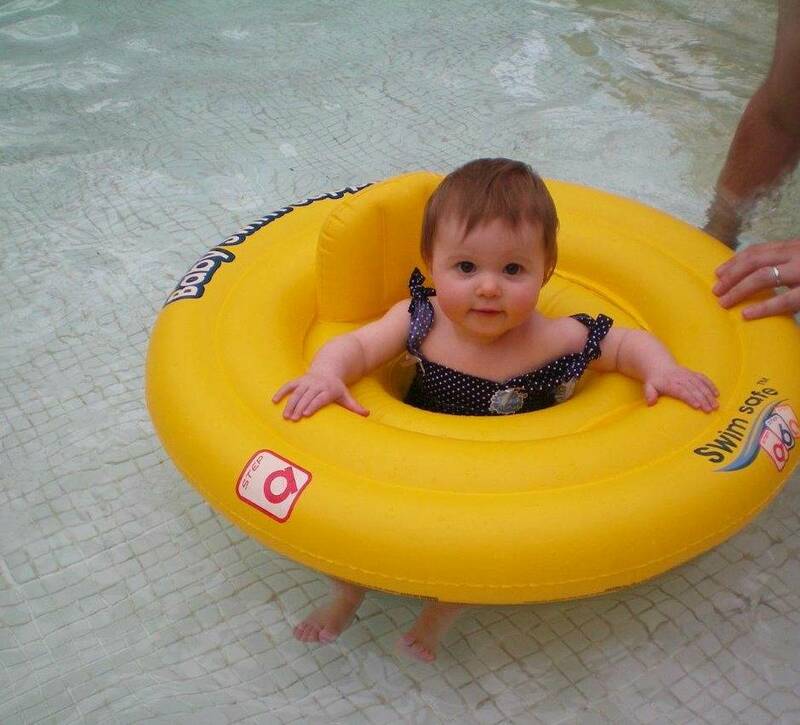 Alice is a little water baby and the swimming pool was great, we spent a lot of time in there during our holiday. They had flumes too, which obviously Alice was too small for, but Andy and I took it in turn to try them out. Then in the evening we gave Alice her dinner at the lodge, before we headed to the village area and they have a lovely family friendly pub in the middle and we were able to have dinner there at 5pm. It was lovely to be able to go out for dinner and Alice snacked on a few bits whilst constantly getting her giraffe to give mummy kisses. It was the best birthday ever! 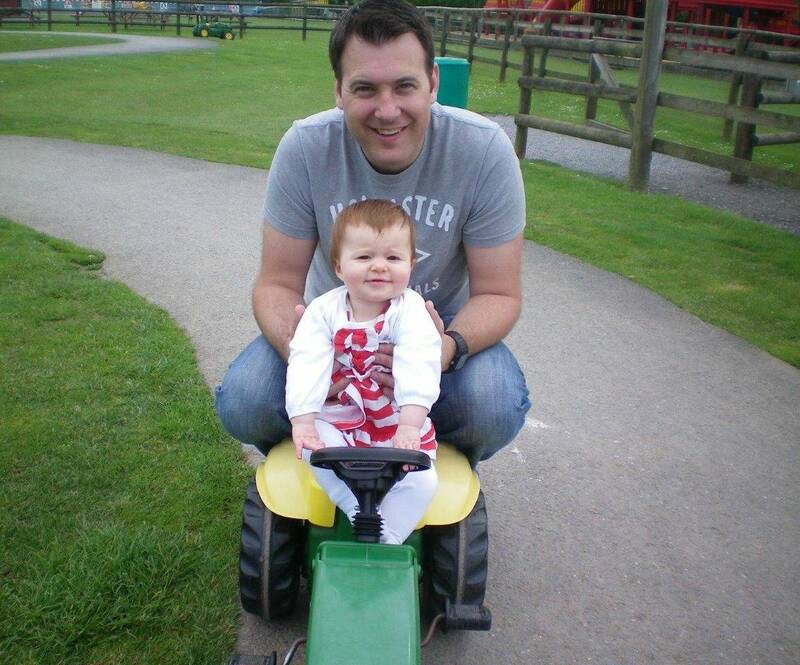 On our last day we went to Folly Farm which was close by and it is by far the best farm place I have been to. There was just so much to do. 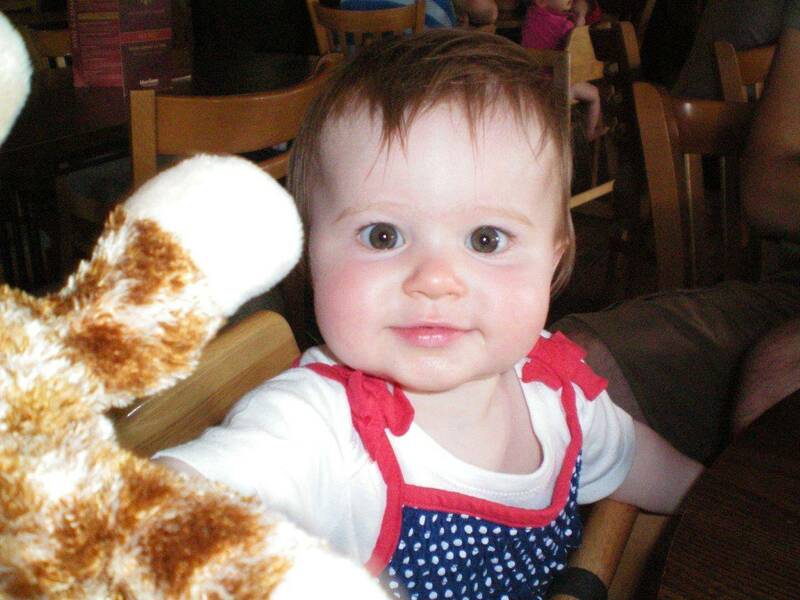 Alice loved seeing all the animals and going on all the playgrounds and tractors, with help from daddy. 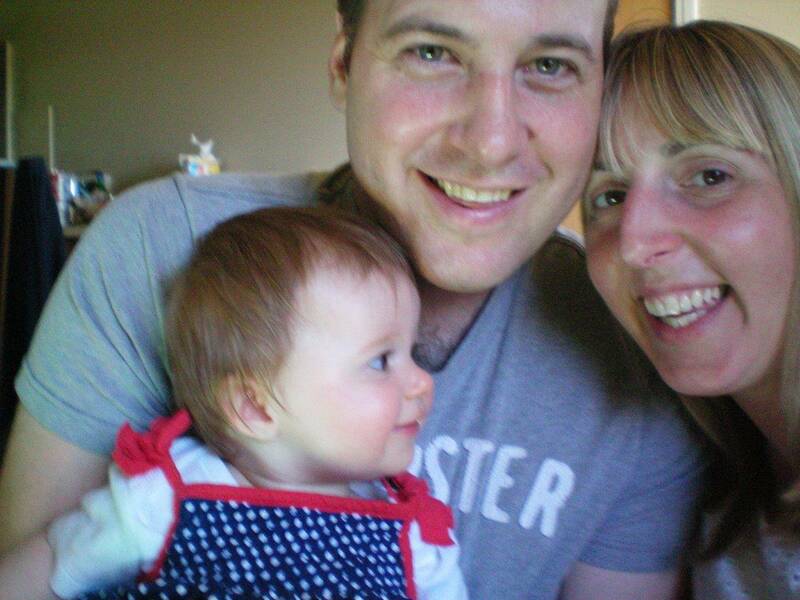 Next week I will be sharing Alice’s first birthday. Previous Post: « Review: Business Cards by Colour Graphics…Why a blogger needs them! Looks like you guys had a lovely time. Love the photos of your little one as a baby. So cute! Looks like you had a great time, holidays are the best which reminds me I must look into booking ours for this summer and updating my sons passport. oh this sounds lovely. I went on lots of holidays with my daughter before marriage but since getting ill 3 years ago we have not really been anywhere. I Look forward to going away eventually and having a holiday. I love the photos . They are so cute! I am the same I like to plan too and get in a fluster if things don’t go according to plan! Aw it must have changed your life but I bet the holiday never felt better in a way! What a fabulous sounding holiday! I remember going to Tenby as a child too – I think UK holidays are so nostalgic for those reasons, every young family wants to holiday in the UK, both because it’s easy, but also to revisit the places they went!